University of Phoenix Main Campus, Tempe | AGTS, Inc. University of Phoenix Main Campus, Tempe | AGTS, Inc.
General Orientation: You can use Google to find 1625 Fountainhead Parkway Tempe, but for parking details, use one of the sets of directions below. COMING FROM THE WEST VIA I-10, take exit 153 (the AZ-143/48th St/Broadway exit) and turn right (south) on 48th St. Continue south on 48th Street until you get to get to Broadway Road. Turn left (east) on Broadway and continue east until you come to the stoplight at 55th St(just under a mile). Turn right (south) on 55th and follow it around until you come to the roundabout at the intersection of 55th and Fountainhead Parkway. Using the roundabout, continue south on 55th to the second building on your right—the beige, multi-story UOP parking structure (Building 2520). Enter and park as far to the west inside the structure as possible (this will save time later). Once you’ve parked, proceed west to the 10-story University of Phoenix Building (Building 1625) across the footbridge. In the lobby, ask for directions to the AGTS classroom if it is not clear from the marquee. COMING UP FROM THE SOUTH VIA I-10, take exit 153-B (52nd St /Broadway exit). When you get to Broadway Road, turn right (east) and continue east until you come to the stoplight at 55thSt (about half a mile). Turn right (south) on 55th and follow it around until you come to the roundabout at the intersection of 55th and Fountainhead Parkway. Using the roundabout, continue south on 55th to the second building on your right—the beige, multi-story UOP parking structure (Building 2520). Enter and park as far to the west inside the structure as possible (this will save time later). Once you’ve parked, proceed west to the 10-story University of Phoenix Building (Building 1625) across the footbridge. In the lobby, ask for directions to the AGTS classroom if it is not clear from the marquee. * Via the 143, continue south until the 143 becomes 48th St and you come toBroadway Road. Turn left (east) on Broadway and continue east until you come to the stoplight at 55th St (just under a mile). Turn right (south) on 55th and follow it around until you come to the roundabout at the intersection of 55th and Fountainhead Parkway. Using the roundabout, continue south on 55th to the second building on your right—the beige, multi-story UOP parking structure (Building 2520). Enter and park as far to the west inside the structure as possible (this will save time later). Once you’ve parked, proceed west to the 10-story University of Phoenix Building (Building 1625) across the footbridge. In the lobby, ask for directions to the AGTS classroom if it is not clear from the marquee. *Via Broadway Road, turn left (south) at Priest Drive. Continue south on Priest until you come to W. Fountainhead Parkway. Turn right (west) on Fountainhead Parkway and continue west until you get to the roundabout at 55th St. Using the roundabout, curve left (south) on to 55th and continue south to the second building on your right—the beige, multi-story UOP parking structure (Building 2520). Enter and park as far to the west inside the structure as possible (this will save time later). Once you’ve parked, proceed west to the 10-story University of Phoenix Building (Building 1625) across the footbridge. In the lobby, ask for directions to the AGTS classroom if it is not clear from the marquee. *Via the 60, you can either merge with I-10 toward Phoenix and follow the directions “B” above OR not go all the way to 10, but take exit 172 (Priest exit north). Turn right on Priest and continue north to W. Fountainhead Parkway (about 1.25 mi). Turn left (west) onFountainhead Parkway and continue west until you get to the roundabout at 55th St. Using the roundabout, curve left (south) on to 55th and continue south to the second building on your right—the beige, multi-story UOP parking structure (Building 2520). Enter and park as far to the west inside the structure as possible (this will save time later). 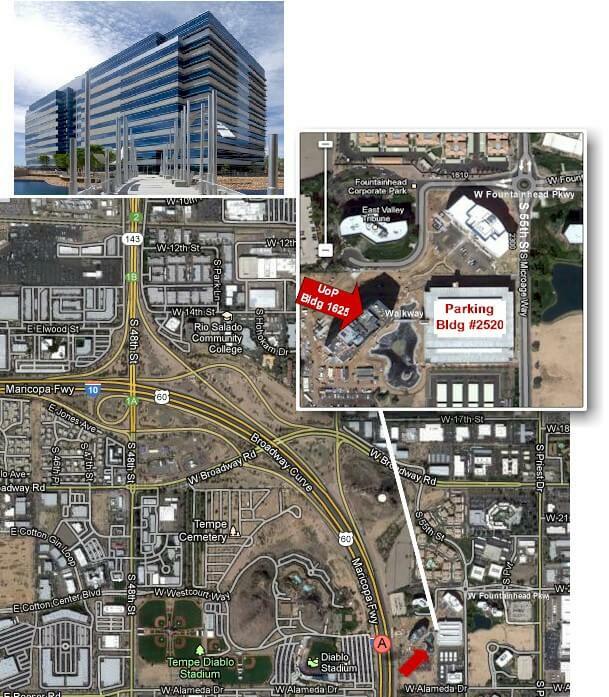 Once you’ve parked, proceed west to the 10-story University of Phoenix Building (Building 1625) across the footbridge. In the lobby, ask for directions to the AGTS classroom if it is not clear from the marquee. 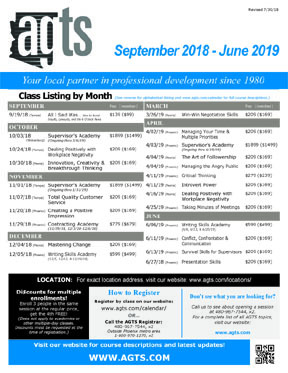 Any AGTS class can be customized and brought on-site to your organization! For more information on this option contact our Custom Training Specialist.